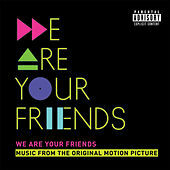 Say what you will about We Are Your Friends, starring Zac Efron as a budding DJ who risks it all for fame, money and love, but the producers certainly captured the sound of EDM circa 2015. Hook N Sling and Tchami represent the bassy bounce of so-called "future house," the Americanos go to bat for big-room energy and Fake Blood give it up for cut-up disco in a post-Daft Punk mold. Gryffin's remix of Years & Years' "Desire," displays the kind of classic house vibes that bridge 2015 and 1995.